See also fs curves by ETHproductions. 06/30/14 Updated many characters using nudging. Info: Created on 8th March 2013 . Last edited on 30th June 2014. Cool font! I found this in "hidden gems" but it seems BETTER than a hidden gem! @Aeolien: Thanks! 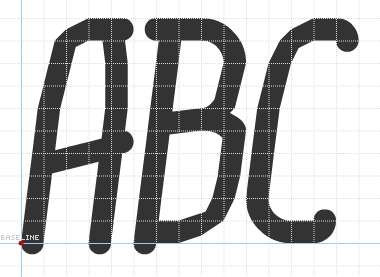 I'm working on the accented characters; I should have them complete later today. @everyone: Thank you very much! Excellent, convincing permanent marker font! Greeeat work! It looks like real handmade pen lettering! I'm with the guys! My 10 2 U.
Congratulations! FontStruct Staff have deemed your FontStruction worthy of special mention. 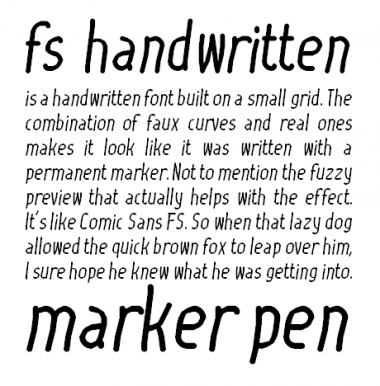 “fs handwritten” is now a Top Pick. @elmo, p2p: Thank you for the votes! So real even being made in small grids! @IEatRaindows: Thanks! Comic Sans was some of the inspiration for this. @Aeolien: YES! That is what we need! @Aeolien: Yes, that's a good idea. If it were possible to trace trolls, they would be less likely to strike, since we'd know who it is. But... I still have 46 downloads, and 29 comments (including this one). Trolls can't take either of those away from me, nor from anybody, as they can take away from the rating. And they definitely can't remove the top pick. So even if they vote down on any TP (or any font, for that matter), they can't kill it completely. @ETHproductions: Me personally don't care if there are troll votes or not, I don't so care about voting. For me a visible sign of good fonts is the number of good comments, and Top Picks. But Top Picks sometimes (in a rare condition) isn't really fair (sorry meek). But the most important, is what you feel about your font. Visible things can be lie. "True fontstructors can't be discouraged! :-)"
If you think your font is good, it's good! What's important is your opinion. Don't care about troll votes, it's not like they can hurt you or anything. Thanks, guys, for supporting me. @cablecomputer: I agree; I don't care very much about troll votes. Also, all these comments so far have been good. And I know what you mean about Top Picks (especially from around the time when Fontstruct had just started). P.S. I'll see what I can do about the w.
Nice new w, thanks for listening to my suggestion! Nice font! I love the rough edges, as they give an authentic handwritten look. 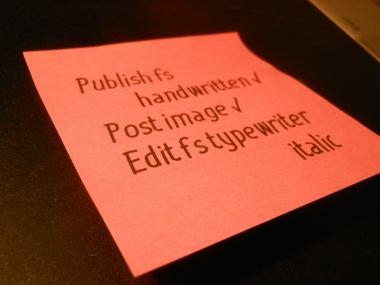 The best handwritten font ever! As always, 10/10. All I can say is … awesome. Nicely done. What is with all these spam accounts? Captchas apparently don't work.